2013 is the year of the 蛇 (shé), i.e the Snake. If you were born a Snake year (here’s how to check), this is your year! Enjoy :). As you’ll see, celebrating the new year in China has a lot to do with scaring away the evil spirits, bringing yourself and your family good luck, prosperity and making sure the new year is off to a good beginning. And partying for 15 straight days, until 元宵 (yuánxiāo) the Lantern Festival, puts an end to the festivities. So, ready to learn how to celebrate? 过春节 : guò chūnjié = celebrate the New Year. 回父母家: huí fùmǔ jiā = to go home to your parents. The making of 饺子,“Jiǎozis”, or dumplings, is a traditional family event on the day before the Chinese New Year (that would be the 9th of February 2013 this year), especially in the Northern part of China. The whole family gathers to make (or wrap – 包: bāo) dumplings and then eat them. Sounds like fun! By making dumplings, some believe they are packing in luck for the coming year. 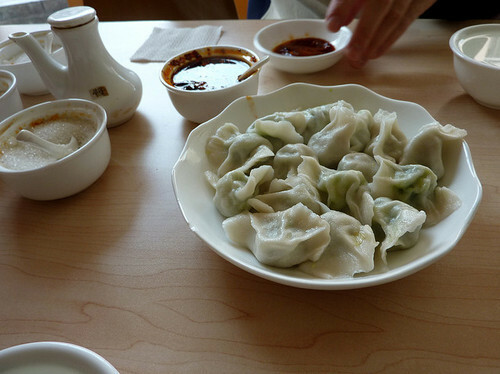 Ancient Chinese coins used to be hidden in the dumplings, also for prosperity. We’ll soon be sharing our own dumpling wrapping secrets and recipes :). Chūnjié de qián yītiān, wǒmen huì bāo jiǎozi. On New Year’s Eve, we make dumplings. Fish is also another key dish for 春节, also for purely symbolic reasons. In Chinese, fish (鱼) is pronounced yú, which sounds like this character: 余, (also pronounced yú). 余 means “remains”, surplus or abundance”. So by eating fish (and some say, leaving a few leftovers), you are hoping for a prosperous year! The tradition is to eat a salad, called 捞鱼生 (lāoyúshēng), composed of raw fish and crunchy vegetables. It is said that the tossing of this salad symbolizes luck and prosperity so the higher you toss the salad and the louder you shout out the name of the salad, the more luck you’ll get in the coming year. 年年有余 : nián nián yǒu yú = May there be abundance year after year! Here are a few key phrases to wish a happy new year to your family, friends and acquaintances once midnight strikes! To wish someone something in Chinese, start by saying : 祝你 : zhù nǐ = I wish you or 祝大家: zhù dàjiā = I wish you all. Both mean Happy New Year! 身体健康! : shēntǐ jiànkāng = May you be healthy! 万: wàn = 10 000. It has also come to mean “everything”,+ 事:shì = thing + 如:rú = if + 意: yì = wish == all the best! Zhù nǐ zàixīn de yìnián lǐ wànshì rúyì! 财源广进 : cáiyuán guǎngjìn = We wish you abundant wealth. This sentence is similar to 年年有余. In China, for the New Year, you buy and wear new clothes. More generally, the idea is to make sure everything is ready to usher in the new year: houses are cleaned, hair is cut, debts repaid, new clothes acquired… so you can start the new year with a clean slate. Regarding the clothes, red colored ones are favored, as it was once believed that red could scare away evil spirits and bad fortunes. Also, red symbolizes good luck and sounds like success. Any excuse to go buy new clothes is a good one. I like this tradition! 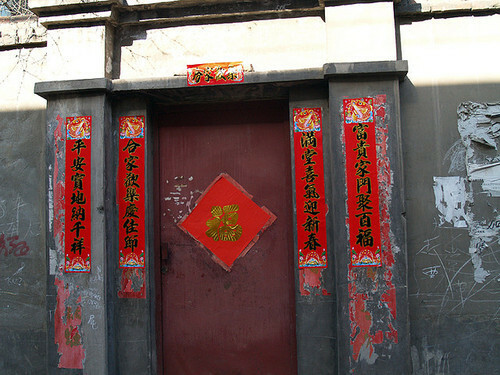 Doors are decorated with vertical scrolls of characters on red paper. The characters are chosen to seek good luck and praise nature. This practice stems from old traditions to keep away ghosts and evil spirits. These vertical scrolls, also called couplets, are 春联 (chūnlián). 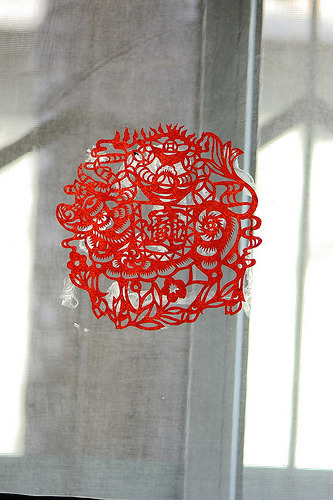 Delicate and intricate red paper cutouts are also stuck on windows. These paper cutouts are called 窗花 (chuāng huā). Firecrackers are a big celebratory thing in China, used for weddings, festivities and of course, the Chinese New Year. 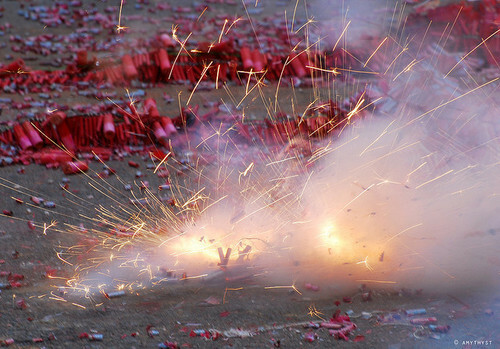 Firecrackers (called 鞭炮 – biānpào – in Chinese) are usually strung together to make more noise, as the noise was thought to scare away evil spirits. The first time I heard firecrackers in China, I honestly thought a riot was going on outside. Silly me. On New Year’s eve, everybody goes outside on New Year’s eve to lit firecrackers and celebrate the beginning of the new year. So get ready to hear serious firecracker blasts once midnight strikes! 红包, hóngbāo, or red envelopes, which contain money, are traditionally given during the Chinese New Year. Literally, they mean lucky money. It is customary for married couples and older folks to give these envelopes to the young ones, which range from the children… to any unmarried person. Bosses also sometimes give those to their employees. Small gifts (food and such) are also exchanged between friends, neighbors … Oranges and citrus fruit are a particularly popular gift. There’s a popular children’s song you can sing for the New Year holiday, called 新年好呀 (Xīn Nián Hǎo Ya! )which you now know means Happy New Year (literally “New Year’s Good, Ya!”). As you’ll hear in the video, the melody is similar to the song “Oh my Darling, Clementine”. 祝贺大家新年好! Zhùhè dàjiā xīnnián hǎo! Happy New Year to you all! 我们唱歌，我们跳舞 Wǒmen chànggē, wǒmen tiàowǔ. We are singing; we are dancing. So, how are you planning to celebrate the Chinese New Year? We’ll be making our own 饺子 of course and we’ll going to our local Chinese restaurant to enjoy a 10 course Chinese New Year Feast 🙂 Yum! Dumpling party for the Chinese New Year 羊年快乐! Happy Year of the Goat and Sheep! Chinese New Year 2015: Happy Spring Festival! 春节快乐! 马年快乐! Happy Chinese New Year of the Horse!